The therapeutic prospects for multiple myeloma and the myelodysplastic syndromes have dramatically changed over the last two decades. The benefits of new therapies to our patients are unquestionable. Improved disease control has resulted in better quality of life, lessened morbidity, and in some cases fewer medical interventions and prolongation of survival. An irony is that the pace of discovery has outraced our ability to sort through the various options (old and new) and order them according to their degree of effectiveness and toxicity. Moreover, the biologic variability of the disease states is considerable. Because treatment A is better than treatment B for one type of myelodysplastic syndrome does not mean it is superior in another type of myelodysplastic syndrome. A treatment that is great for refractory anemia may not be at all optimal for refractory anemia with excess blasts. The disease heterogeneity makes conduct of clinical trials difficult and application of the lessons of trials to clinical practice even more challenging. Treatment selection is made even more difficult by individual patient factors, especially comorbidities. For example, a frail elderly person who struggles with ambulation due to arthritis could face severe threat from a regimen that causes neuropathy, even though that regimen may be more effective against multiple myeloma. 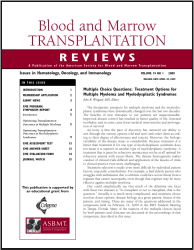 One could simplistically say that much of the dilemma one faces with these two diseases is “To transplant or not to transplant, that is the question.” Actually, it is much more complicated, and treatment choice involves donor options, disease biology in a given patient, fitness of the patient, and timing. These are many of the questions addressed in the symposium held on February 14, 2009 at the BMT Tandem Meeting in Tampa, Florida. Many of the nuances of the multiple choices faced by both patients and clinicians are discussed in the proceedings of that symposium, described in this issue.